The Florida Prince peach is on the tail end of blossoming, with Earligrande and Eva’s Pride peaches right behind. The weather is much nicer than last year and so the tree was humming with bees as I was doing some belated pruning on it. 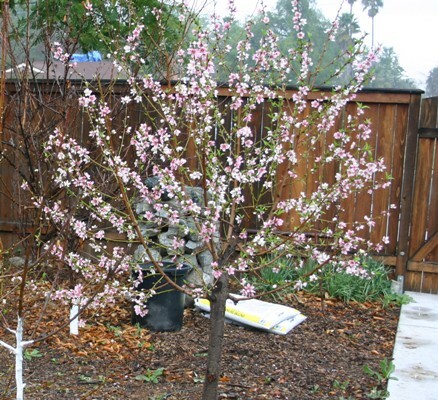 We have three early peach varieties that should be attracting pollinators for what is the main event to us, our Minnie Royal and Royal Lee cherries, which absolutely need to cross-pollinate or we’ll get squat. I’m hoping this flurry of pollination will stick around for the Royal Ann and Lapins to cross-pollinate, as both expode in blossoms that dry up and fall off to reveal one or two cherries. The Southern Highbush blueberries are waking up though and we’re trying a few more varieties this year. Stay tuned for the Anna and Dorsett Golden apple blossoms, which are warming up for a symphony of color. 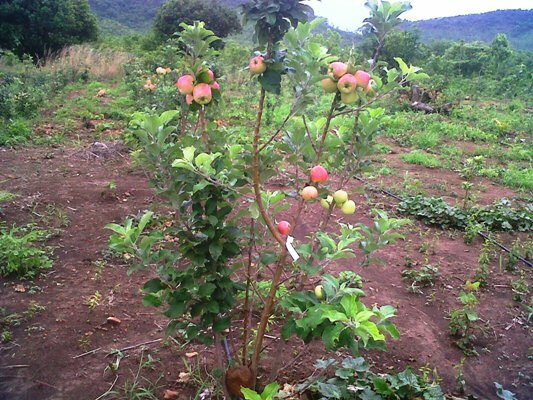 You may recall last spring that a group in Uganda decided they could do their own apple grafting, and so I sent just the rootstocks and scionwood to them, along with some elementary grafting tools and an instructional video. 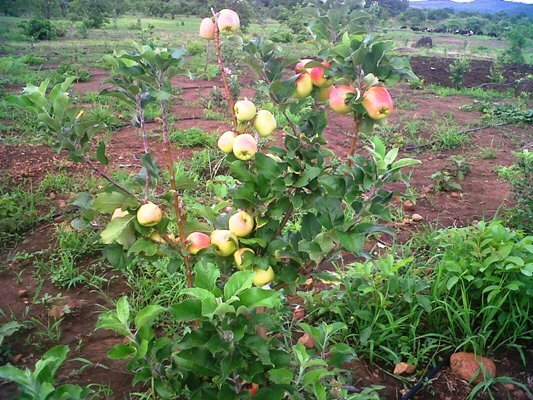 Well they got right down to it, and grafted about 1,000 trees in short order and in the process became the most experienced apple grafters in Kampala! “The continental climate of the district is modified by the large swamp area surrounding the southern part of the district. The rainfall in the district is bimodal with one peak during April-May and the other in August-October. The average annual rainfall in the district varies between 1200-1600 mm (47-62″) decreasing northwards. The rainfall is mainly convectional and normally comes in the afternoons and evenings. The average minimum and maximum temperatures are 22.5 C (72 F) and 25.5 C (78 F), respectively. Absolute maximum temperature hardly goes beyond 36 C (97 F), and absolute minimum hardly falls below 20 C (68 F). As you can see by the bananas, maize, and sweet potatoes in the background, this isn’t exactly tradional apple country; it receives zero chilling hours. But apples will grow and fruit here, despite all the literature saying this can’t happen. We’ll be sure to be sending updates as they harvest. I picked the last Lady Williams apple today, a few weeks earlier than last year (it was good; juicy, with a nice tart/sweet combination, definately on the tart side). And of course, the first blossoms on Dorsett Golden today caught me by surprise, as it always does and then I start scrambling to check other trees in town to see if they’re still dormant enough for me to cut scionwood off of them. Checking my logs the Dorsett Golden blossom is right on time, which means Anna is due in a day or two also and I also need to cut that scionwood. I don’t know why this catches me off guard every year, maybe because I get caught up in “dormant period” tasks when we really don’t have a dormant period. I don’t envy the ice, snow, and misery of my northern fellow growers, but I do envy the true “down time’ they enjoy when they can retire to the barn and sharpen and maintain equipment, look at catalogs, and generally plan the new year while the orchard sleeps under a blanket of snow and then wakes up all at once in an orderly fashion in late April. Here the bloom lasts 5 months and I’ll be fighting earwigs and codling moth the whole time. But I will admit the weather this week has been glorious, around 80 every day for the high and in the mid-50’s at night with a nice breeze to cool you off around noon under a deep blue sky and snow-capped mountains in the distance. The citrus is starting to ripen and so I’ll feature a couple of oranges in the next few days. 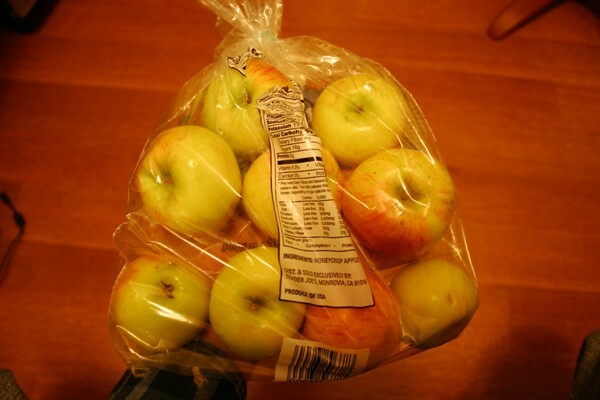 I bought a bag of the most horrible Honeycrisp apples from Trader Joes this week. They were very green (unripe), bland, tasteless, with not even a hint of sweetness. I had hoped that they were just shaded during the season and didn’t get much color, but were still sweet and juicy inside. Nope, they were just picked way too early and marketed anywaywith this lousy quality. This just adds justification to breeders who want to protect their brand with strictly-controlled co-ops, who can dictate quality standards for any of their brand that reaches market. If I had not known much better, I would have determined from this bag that Honeycrisp is a horrible apple, and that I prefer sweeter apples like Pink Lady instead. Now Pink Lady is the trademark name for Cripp’s Pink apples that are grown to the standards set by the Pink Lady marketing association, and usually consumers will get a good taste experience, something not guaranteed by the expired-patent, non-trademarked Honeycrisp. For that matter, it really lowers the bar on how good my homegrown apples have to be to beat the taste of supermarket apples. But no worries there, the Honeycrisp we grow here in the heat are outstanding and are on par with even the best of what I’ve tasted in the store or even local mountain U-pick orchards, and we’re testing them in Africa also. I received the above photo from Zambia today; this is a row of Dorsett Golden trees that were planted from benchgrafts 21 months ago (notice the rock limb spreader). These beauties blow away anything that’s in the market there. Anna was harvested earlier, and both come into bearing quite early in their lives. The elevation here is about 1,100 meters and it rarely if ever gets below 50 degrees, meaning it gets zero chilling hours. The “blockish” shape on the apples is typical, as is the pink blush on the sunny side. These trees are quite happy here and will get pretty big, producing a crop of apples and a crop of scionwood for propagating new trees every year. 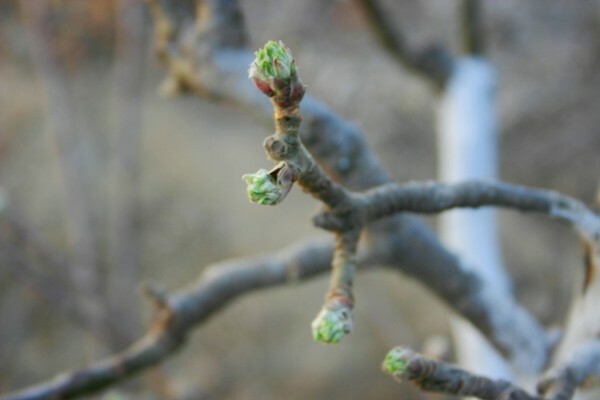 They will also adapt to the tropic climate and have less “blind wood” (branches without leaves) in future years.